Tonight’s dinner was American themed – barbecue pulled chicken, fries and coleslaw. And I conveniently had some spare brownies from the batch I made for hubby to take to Monday Night Football (MNF) tomorrow night. Apparently, these brownies were endorsed by Oprah. Everything I’ve made from the Baked cookbook has been great. These brownies are also great, except unfortunately a little salty. I rarely use the full amount of salt in any recipe but today I did and now regret it. Sorry about that, MNF guys! 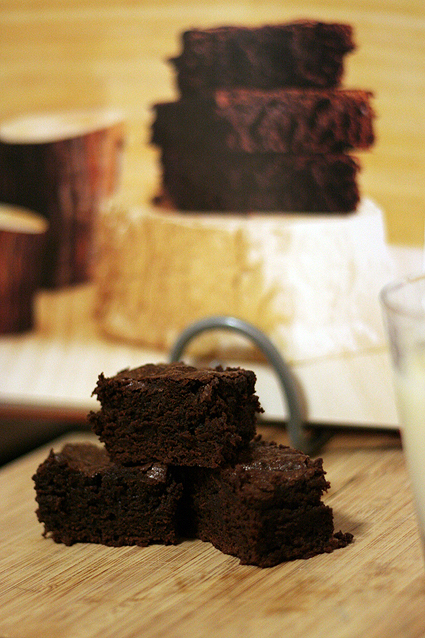 The brownies are otherwise delicious and are dense and fudgy in texture. I think my usual recipe (Donna Hay) is even fudgier than these, but I do tend to undercook them a little to make sure of that. These brownies baked for 30 minutes, as suggested. I used Nestle Plaistowe 70% Cocoa Dark Chocolate and Van Houten Cacao Poeder (cocoa powder). I didn’t use the espresso powder, as I didn’t have any in the cupboard and couldn’t justify buying some just to use a teaspoon in these brownies. The recipe is floating around the web but here is a link to one site that has posted all of it, complete with hints from the authors. I’ve been looking for good brownie recipe… thanks for the links. Hope it goes well for you! It looks like you have lots of tasty recipes on your site too.